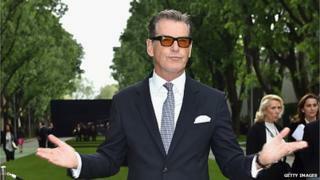 Pierce Brosnan has been stopped by airport security officials for trying to board a US flight carrying a knife. The former 007 star was apprehended by Transportation Security Administration agents at Burlington International Airport in Vermont with the 10in (25cm) hunting knife in his hand luggage. The local police department said Brosnan was allowed to continue his journey after the issue was resolved. The Irish-American's James Bond films include GoldenEye and Die Another Day. Brosnan, 62, was reportedly embarrassed and angry when the knife was taken away by agents. TSA rules state that sharp objects such as knives, box cutters and scissors longer than 4 inches must be stored in checked baggage. Lieutenant Shawn Burke, from the Burlington Police Department, said airport authorities told him about Brosnan's encounter with Transportation Security Administration officials. He said the Irish actor "was encountered by TSA at one of their checkpoints" and was allowed to continue his journey after the issue was resolved. The actor has not commented on the incident.